Nikon vs Zeiss or the Monarch 5 ED vs Terra ED. Which to Choose? Nikon vs Zeiss, the Monarch 5 ED vs Terra…. A Nikon vs Zeiss comparison is almost an obligation now that Zeiss has entered the competition at a price point where more of us will be considering whether or not we may wish to own one. The Nikon entry to such a comparison is, of course, the relatively recently introduced Monarch 5 with ED glass used for the objective lenses since it compares to the price point for Zeiss' Terra model, also with ED glass. In this Monarch vs Terra binocular comparison review, we'll focus only on those items which we believe are significant to such a comparison. In doing so, we'll leave out a number of facts or details which may be quite significant, but which are covered in the individual reviews for these two binoculars. 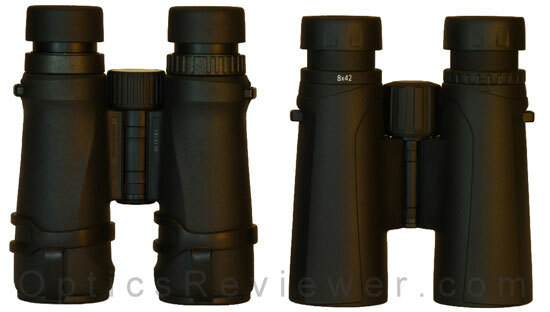 Before you give strong consideration to either binocular, we urge you to read both of their individual reviews. 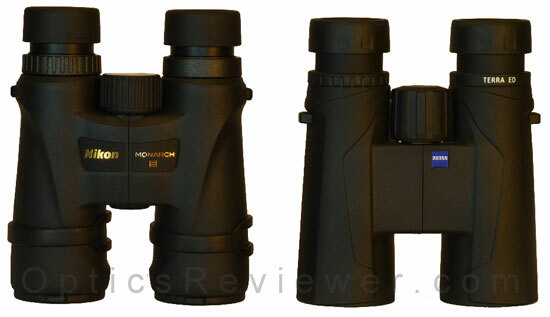 To start a comparison review of these binoculars, let's consider their bodies and then move to their optics…. While the Ziess Terra binocular's chassis is a polyamide and the Nikon Monarch's is a polycarbonate resin, both are lightweight and strong. Both are further strengthened by being reinforced with fiberglass. We don't have information that either has a significant edge over the other in typical consumer binocular use. Short of putting them into a laboratory and destroying them to see which might actually be stronger, we're going to call them approximately comparable in this area. This doesn't seem likely to be a major factor, but may be significant if all other things are equal for the person considering a Monarch vs Terra selection. The eyecups on the Monarch 5 ED we tested were smoother and the detents more obvious in "catching" the eyecup positioning. Our Terra's eyecup rotational action was somewhat stiffer and the detents at the intermediate height adjustments less obvious. It may have simply been the Terra we had for testing and it may be that the Terra's eyecups would loosen slightly with use — making the Terra's detents more obvious. Again, unless they're lining up as equal in every regard other than this for your particular intended use, we don't perceive this to be a major item in choosing between these two binoculars in this Nikon vs Zeiss comparison. For eye relief, the Monarch 5 has about an additional 1.5mm in the 8X42 configuration and 3.6mm in the 10X42 configuration. That's enough additional eye relief for the 10X configuration to be significant for some who use eyeglasses when compared to the Terra ED's 14.0mm of eye relief in the 10X binocular. This is an area where we think there is a significant difference between the Monarch 5 ED and Terra ED binoculars that's worthy of careful consideration in this Nikon vs Zeiss comparison. For the birder, sports enthusiast, hunter, plane spotter, and those who simply enjoy the outdoors, the single revolution of the focus wheel is a definite advantage in being able to quickly achieve a well-focused view and be able to pick up details. When you need to shift quickly between views at varying distances, the Terra ED binocular's focusing mechanism gives you the ability to do so more quickly, with precision provided by practice, than a slower focusing mechanism. The argument to be made for the Monarch 5 ED's somewhat slower mechanism, at 1.5 revolutions of the focus wheel, is that a more precise focus can be achieved more easily and we'll readily concede that will be a factor for some. It has been our experience, however, that a relatively brief period of practice is all that's typically necessary for a person to become comfortably acclimated to single-revolution focusing capabilities. After that "get acquainted" period, the average binocular user readily and easily stops at more precise focus points than typical when using a 1.5 revolution binocular. With both binoculars being made at optical manufacturing operations in China, one wouldn't expect this to be a consideration between the two binoculars and perhaps it won't be. Because Nikon has been working with manufacturing in China for a number of years, however, it may be possible that they worked any bugs out of the process in the past. Since we understand this to be the first significant manufacturing program in China for Zeiss, we suppose that some will be watching to see how Zeiss manages its quality control for the Terra ED. The field of view for the 8X42 configurations is specified at 329ft/110m or 6.29° for the Monarch 5 ED and 374ft/125m or 7.14° for the Terra ED. In this Terra vs Monarch comparison, that's an advantage of 45.0ft/13.7m or 0.85° for the Terra ED's field of view. What about their usable field of view, you ask? Given the size of the optical "sweet spots" of the binoculars we purchased to test for our reviews (and as outlined in their individual reviews), we calculated that the Terra ED binocular had an approximate 76.0ft/23.2m field of view advantage before a subtle softening of the details became perceptible in our test binoculars. The Terra ED had an advantage of 82.4ft/25.1m usable field of view before details began blurring in the binoculars we tested. Most binocular users agree that being able to see what is happening is one of the primary reasons for using binoculars. In other words, most of us don't use a binocular only for viewing stationery objects — reading distant street or road signs and so on. When using a binocular the field of view's usable diameter affects our ability to see and understand what's happening in a location distant to us. For a bird watcher that includes being able to track birds in flight and sports enthusiasts want to keep up with the action. For plane spotters, it means being able to quickly locate a distant airplane visually and for hunters it's all about both seeing and evaluating game options that may be gathering in the distance. Those differences between the Monarch 5 ED and Terra ED binoculars' usable fields of view are significant differences in favor of the Terra ED binocular, in our opinion. This is something we initially were not going to mention in this comparison. The reason for leaving it out was because we already mentioned above that this article would focus on those areas where there was a significant difference between the two binoculars. Because we didn't perceive a difference between the two instruments. However, as we considered it further, we felt that some may have felt that we inadvertently omitted the information. For the record, with the two binoculars which we purchased for testing and review, we did not perceive a difference in this area. Similar to the chromatic aberration and resolution of details above, we nearly left brightness and low light viewing out of this comparison. The reason? Because it wasn't something that would enter into deciding whether to select a Nikon vs Zeiss in this comparison. Interestingly, we did not perceive a difference between the new Monarch 5 vs Terra binoculars when comparing their performance in low light conditions. For some binocular users more than others, the close focus distance can be a significant factor. If this includes you, you'll want to know that the close focus for the Terra ED was significantly less than the Monarch 5 ED. The measurements for the 8X42 configurations we tested were specified at 8.2ft/2.5m for the Monarch 5 ED with our test unit coming in at 7.5ft/2.3m and specified at 5.3ft/1.6m for the Terra ED with our test unit coming in at 4.7ft/1.4m. We would be comfortable recommending either of them for bird watching. We would give a slight edge to the Terra ED's rain guard for covering the oculars better and more securely than that which is supplied with the Monarch 5 ED. Of course, there are excellent rain guards which fit most eyecup diameters available on the secondary market these days if you'll be using your binocular in wet, rainy weather and you find those supplied with any binocular to be ineffective. The covers for the objective lenses were unquestionably, in our opinion, more effective and practical with the Monarch 5 ED binocular and a point for it in this Nikon vs Zeiss comparison. The objective lens covers are not typically a decisive factor in selecting binoculars, but we offer the observation for those who may be interested. Overall, while both binoculars had desirable characteristics, we found ourselves liking the Terra ED binocular when it came to what we felt were significant areas of performance. Two particular areas stood out to us — the speed of focus and the field of view. In this Zeiss vs Nikon comparison, we could be quite happy with either one if we received it as a gift. If we were selecting and ordering it for ourselves, however, we would get the Terra ED. Why not check them out? These links will take you directly to the Terra ED selections at Amazon.com and Amazon.co.uk . These links will take you directly to the Monarch 5 ED selections at Amazon.com and Amazon.co.uk . We like Amazon and Eagle Optics for their pricing and customer service! Please read the reviews of these individual binoculars before giving further consideration to which might be best for you! These links take you to the Zeiss Terra ED review and the Nikon Monarch 5 ED review.